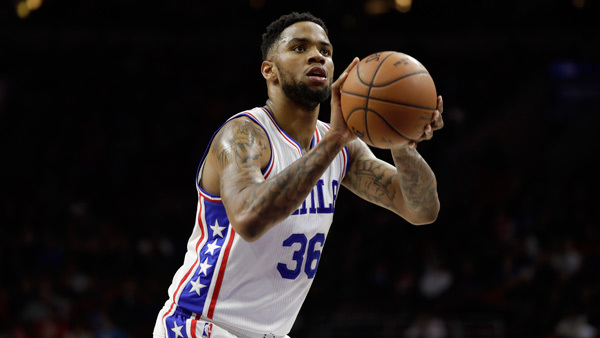 PHILADELPHIA (WPVI) -- The Philadelphia 76ers have announced the signing of forward-center Shawn Long. Long first signed a 10-day contract with the 76ers on March 6 after being called up from the Delaware 87ers. He has appeared in four NBA games, averaging five points and three rebounds in eight minutes per game. In 39 games with Delaware, he led the team with averages of 20 points and 11 rebounds in 30 minutes per game, while shooting 54 percent from the field. He was named a 2017 NBA D-League All-Star. Long originally signed with the 76ers on July 8, 2016 before being waived on October 24 and joining the Sevens. Long played four collegiate seasons (2013-16) at the University of Louisiana-Lafayette, posting 17 points, 11 rebounds and two blocks in 30 minutes per game. As a senior, he was named 2016 Sun Belt Conference Player of the Year.